KRAKOW TOURS – Krakow went to the dogs in the best possible way this weekend, as an army of dachshunds descended on the city centre. The dogs – and their owners – were marched from the Barbakan, along Floriańska t o the Market Square at noon on Sunday. The march was led by a brass band and flag-bearers. Animal lovers ignored the light drizzle to line the route, and gathered in the square to meet the pampered pooches. There were even a few interlopers from other breeds, come to pay their respects. The Dachshund March, or Marsz Jamników, has been held annually in Krakow for the past 15 years. This year’s theme was the Battle of Grunwald, to commemorate the 600th anniversary of the decisive victory. 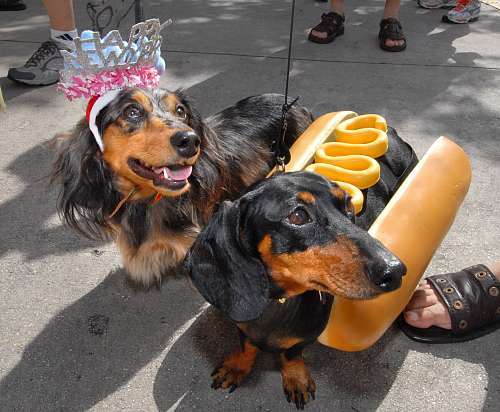 The dogs arrived dressed in various costumes, or au naturelle to show off their sleek forms. KRAKOW TOURS – At various points in the medieval ages, Krakow was under siege, and the defenders were slowly losing their hopes – not to mention supplies. On one ocassion they were so desperate that they started to eat the Krakow pigeons. The Krakow authorities opposed this, thinking the pigeons could be useful in other ways – like bringing small quantities of grains or other foods to the city. After a few more days, one of the Krakow defenders decided to try and sneak through the enemy lines to find out if help is on the way. He took a few pigeons with him to contact the city. After some time, one of his pigeons landed on the roof of one of the houses. It was quickly captured, and on his leg the defenders found a note that infused their hearts with hope: “Relief will come in six days, hold on”. The Krakow defenders prepared to attack on the sixth day, to help their rescuers crush the opponent by catching them in crossfire. On the evening of the fifth day, nobody even noticed that another pigeon landed on the tower of one of the Krakow churches… At dawn on the sixth day, the Krakow knights attacked with double confidence in their force, expecting the rescuers to come any minute. The sieging army was so surprised that it gave hardly any resistance, and fled, leaving behind almost all of their camp. Krakow knights were beaming with happiness, and only in the evening someone caught the pigeon that flew in the day before. A note tied to his leg said: “Flooding river. Crossing impossible. Rescue won’t come. Give the city up”. The worst flooding for over a decade struck Poland killing at least seven people and leaving a trail of devastation from the Czech border to Warsaw that could cost the country in excess of EUR 2 bln. After days of wet weather a 24-hour downpour dropped 20 centimetres of rain on parts of southern Poland over Sunday and Monday, the equivalent of two months’ worth of rain in one day. The deluge led to widespread flooding, first on the Czech and Slovak borders, and then further into the heart of Poland as water flowed down the rivers Wisla and Odra. Hundreds of homes were flooded and thousands of people displaced despite the best efforts of thousands of fire-fighters, troops and volunteers to shore up dykes and flood barriers. Donald Tusk, the prime minister, called on people to heed evacuation warnings as water levels on the Wisla hit their highest point since the Second World War. “I appeal to everybody to evacuate when the police or firemen come and say it is time. You must not wait,” said the PM. “I know these are tragic decisions that have to be made, but it will only be worse if you endanger your own lives and those of the rescue teams trying to get people out of already flooded areas,” he added. As the flood closed in on Warsaw the water river rose to 700 centimetres prompting fears of extensive flooding in the capital, and adding to the already massive bill the deluge had caused. “I expect the losses will top EUR 2 bln and I know we will have to find more funds,” said a sombre Mr Tusk while visiting the flood stricken regions. With little in the way of extra cash in the state’s coffers, the government said that it might ask the EU for emergency aid. Anna Konik-Zurawska, a regional development ministry spokeswoman, said that under EU rules Poland can draw on the European Solidarity Fund when losses surpass a certain level. “In Poland‘s case, the European Commission set the level at EUR 2.125 billion,” she told the PAP news agency. KRAKOW TOURS – It is enough to make a patriotic Pole need a stiff drink to get over the shock – an English vodka has been voted the best in the world. Chase Vodka has triumphed in the 2010 San Francisco World Spirits Competition, beating 249 rivals from around the globe, including Russia and Poland’s finest. Tasted under blind conditions (all the bottles were covered to maintain anonymity), Chase was preferred by a 30-strong panel of independent judges. And instead of being produced by one of the global drink giants in a huge, automated distillery, Chase is made on a farm in Herefordshire – from potatoes. The spuds are all grown in the farm’s own fields, before being added to water, fermented, and then distilled and bottled. It all takes place on site. First produced in 2008, Chase is the brainchild of potato farmer William Chase, the man who founded posh crisp company Tyrrell’s. When he sold Tyrrell’s to a private equity group that same year, Mr Chase realised he needed to find something else to do, and the vodka business was born. Despite having no distilling experience, he decided to aim for the gourmet end of the vodka market and use his crops of traditional variety potatoes instead of the more usual wheat or rye grains. Now making 1,000 bottles a week – a drop in the ocean compared with the best-known global vodka names – Mr Chase says demand is soaring in the US thanks to winning the San Francisco competition. “Winning the award has been fantastic for us,” he says. KRAKOW TOURS – A man was arrested for failing a breathalyser test – after driving to the police station on his own accord. In order to prove to his wife that he wasn’t drunk, the 44-year old from the small southern town of Sedziszow made his way to the station demanding to take the test. But once inside, results showed him to be over the limit with alcohol in his bloodstream. Police have since removed his license.